Jay Silverheels (May 26, 1912 – March 5, 1980) was one of the most famous and successful Canadian actors in the history of Hollywood. For decades, The Lone Ranger and his trusty sidekick Tonto were pop culture symbols as universally identifiable as Mickey Mouse. Silverheels was born Harold J. Smith on the Six Nations of the Grand River First Nation, near Brantford, Ontario, Canada, one of 11 children of a Canadian Mohawk tribal chief and military officer, Major George Smith. Silverheels excelled in athletics and lacrosse before leaving home to travel around North America. In the 1930s, he played indoor lacrosse as Harry Smith with the “Iroquois” of Rochester, New York in the North American Amateur Lacrosse Association. He lived for a time in Buffalo, New York, and in 1938 placed second in the middleweight class of the Golden Gloves tournament. While playing in Los Angeles on a touring box lacrosse team in 1937, he impressed Joe E. Brown with his athleticism. Brown encouraged Silverheels to do a screen test, which led to his acting career. Silverheels began working in motion pictures as an extra and stunt man in 1937. He was billed variously as Harold Smith and Harry Smith, and appeared in low-budget features, westerns, and serials. He adopted his screen name from the nickname he had as a lacrosse player. From the late 1940s, he played in major films, including Captain from Castile starring Tyrone Power, I Am an American (1944), Key Largo with Humphrey Bogart (1948), Lust for Gold with Glenn Ford (1949), Broken Arrow (1950) with James Stewart, War Arrow (1953) with Maureen O’Hara, Jeff Chandler and Noah Beery, Jr., The Black Dakotas (1954) as Black Buffalo, Drums Across the River (1954), Walk the Proud Land (1956) with Audie Murphy and Anne Bancroft, Alias Jesse James (1959) with Bob Hope, and Indian Paint (1964) with Johnny Crawford. He made a brief appearance in True Grit (1969) as a condemned criminal about to be executed. He played a substantial role as John Crow in Santee (1973), starring Glenn Ford. One of his last roles was a wise white-haired chief in The Man Who Loved Cat Dancing (1973). 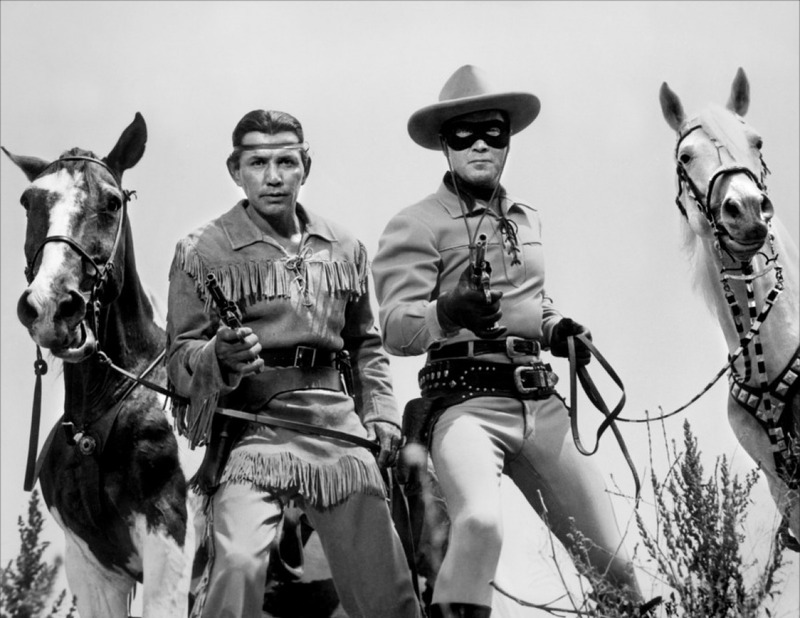 Jay Silverheels with Clayton Moore as the Lone Ranger. Silverheels achieved his greatest fame as Tonto on The Lone Ranger, starring Clayton Moore. The fictional story line maintains that a small group of Texas Rangers, except for The Lone Ranger, were massacred. The Lone Ranger and Tonto then ride throughout the West to assist those challenged by the lawless element. Their expenses (and bullets) are provided through a silver mine owned by The Lone Ranger, who also names his horse “Silver”. Being irreplaceable in his role, Silverheels appeared in film sequels: The Lone Ranger (1956) and The Lone Ranger and the Lost City of Gold (1958). When The Lone Ranger television series ended, Silverheels found himself firmly typecast as an American Indian. On January 6, 1960, he portrayed an Indian fireman trying to extinguish a forest fire in the episode “Leap of Life” in the syndicated series, Rescue 8, starring Jim Davis and Lang Jeffries. Eventually, he went to work as a salesman to supplement his acting income. He also began to publish poetry inspired by his youth on the Six Nations Indian Reserve and recited his work on television. In 1966, he guest-starred as John Tallgrass in the short-lived ABC comedy/western series The Rounders, with Ron Hayes, Patrick Wayne, and Chill Wills. Despite the typecasting, Silverheels in later years often poked fun at his character. In 1969, he appeared as Tonto without The Lone Ranger in a comedy sketch on The Tonight Show Starring Johnny Carson. The sketch was featured on the 1973 record album Here’s Johnny: Magic Moments From The Tonight Show. “My name is Tonto. I hail from Toronto and I speak Esperanto.” In 1970, he appeared in a commercial for Chevrolet as an Indian chief who rescues two lost hunters who ignored his advice in that year’s Chevy Blazer. The William Tell Overture is heard in the background. Silverheels hilariously spoofed his Tonto character in a famous Stan Freberg Jeno’s Pizza Rolls TV commercial opposite Clayton Moore, and in The Phynx, opposite John Hart, both having played The Lone Ranger in the original television series. He appeared in three episodes of NBC’s Daniel Boone, starring Fess Parker as the real life frontiersman. His later appearances included an episode of ABC’s The Brady Bunch, as an Indian who befriends the Bradys in the Grand Canyon, and in an episode of the short-lived Dusty’s Trail, starring Bob Denver of Gilligan’s Island. Married in 1945, Silverheels was the father of three girls and a boy. Star on the Hollywood Walk of Fame at 6538 Hollywood Blvd. 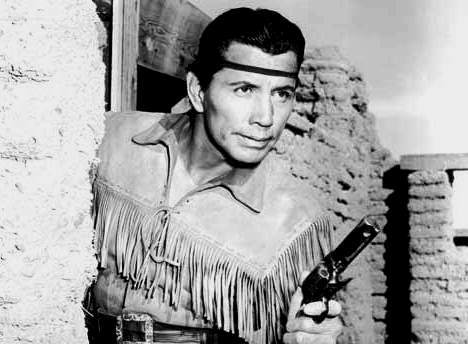 Jay Silverheels died on March 5, 1980 from complications of a stroke at age sixty-seven in Calabasas, California. He was cremated at Chapel of the Pines Crematory, and his ashes were returned to the Six Nations Reserve in Ontario. In 1993, Silverheels was inducted into the Hall of Great Western Performers at the National Cowboy & Western Heritage Museum in Oklahoma City, Oklahoma. He was named to the Western New York Entertainment Hall of Fame, and his portrait hangs in Buffalo, New York’s Shea’s Buffalo Theatre. He has a star on the Hollywood Walk of Fame at 6538 Hollywood Boulevard. First Americans in the Arts honored Jay Silverheels with their Life Achievement Award. In 1997, Silverheels was inducted, under the name Harry “Tonto” Smith, into the Canadian Lacrosse Hall of Fame in the Veteran Player category in recognition of his lacrosse career during the 1930s. In the early 1960s, Silverheels supported the Indian Actors Workshop, where American Indian actors refined their skills in Echo Park, California. Today the workshop is firmly established.